Doyle had been writing Sherlock Holmes stories for a while, and although that character was amazingly well liked (and almost a celebrity in his own right), Doyle had got fed up with him and wanted to move on to other projects. 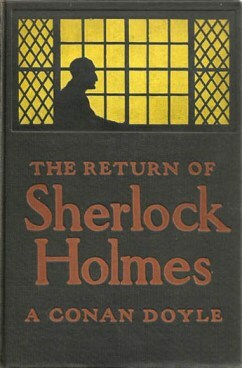 However, when Holmes was “killed” in an earlier story, there was a huge public outcry and Doyle felt that he had to bring him back from the dead. This was easier to do than would be expected, as the story wherein Holmes dies is a bit wish-washy about the details of his death, and so it wasn’t that hard to provide details that would prove he was alive in other ways. This bad-tempered side of Holmes comes out more clearly and more defined in this anthology, and I am wondering if it’s because Doyle was grumpy about having to resurrect him when he had thought he was done with that character. (Doyle was an interesting person, in and of himself, but I’ll travel down that rabbit hole another day. In the meantime, here is the official website of the Sir Arthur Conan Doyle’s Literary Estate… http://www.sherlockholmesonline.org/). An interesting parallel to this is that another book that I am currently reading (“The Devil and Sherlock Holmes” by David Grann) is non-fiction and one of its chapters details the curious tale of how one of the world’s foremost scholars of Sherlock Holmes died a suspicious death after he started to get involved in the large stash of Doyle’s personal papers which was supposed to go to the British Museum, but somehow (through family machinations) ended up on the auction block at Sothebys. (The papers – the important ones, at least – did get to the British Museum in the end, but it was a lengthy journey.) So – even after Doyle is long dead and his characters are historical icons, there is still mystery surrounding the whole topic. Tasha's review of "A Scandal In Bohemia," "The Final Problem," and "The Empty Room" here. Tasha's review of The Sherlockian by Graham Moore at Truth, Beauty, Freedom, and Books.